After winning 44 percent of the Hispanic vote on Election Day, Gov.-elect Greg Abbott may find himself in turbulent political waters as he attempts to balance the interests of his Republican base and his newfound Hispanic friends. Lawmakers in the Republican-controlled Legislature, which convenes in January, are already filing bills, several involving immigration, that will force Abbott to pick between the wishes of his Republican base and the interests of his newfound Hispanic friends. He must also manage an increasingly conservative faction of the Republican Party, including incoming Lt. Gov. Dan Patrick, who has pledged to repeal a tuition program popular among Hispanics. And Abbott, the current attorney general, had to fulfill a campaign promise by filing a lawsuit challenging President Obama’s executive order protecting up to five million undocumented immigrants, including half a million Texans, from deportation. “By winning the election and being successful among Hispanics in a low-turnout election, Greg Abbott has not solved the fundamental problem that he has politically,” said Jim Henson, a Texas Tribune pollster and director of the Texas Politics Project at the University of Texas at Austin. The thorniest issue Abbott may face is a proposed repeal of the so-called Texas DREAM Act, which allows some undocumented students to pay in-state tuition at public universities and community colleges. For most of his campaign, Abbott avoided taking a definitive stance on the act. He urged reform of the program, not a repeal. In a September debate with his Democratic opponent, state Sen. Wendy Davis, Abbott said he would not veto a repeal of the tuition law if it reached his desk. If Patrick makes good on his vow to push through a repeal bill, that could prove problematic for Abbott and Republican courtship of Hispanics, said Hector De Leon, co-chairman of the Associated Republicans of Texas, which reaches out to Hispanic voters. If the Legislature forces his hand, Abbott will also have to decide whether to sign or veto another bill that would ban “sanctuary cities” — those that do not enforce federal immigration laws. On sanctuary cities, Abbott recently avoided taking a position, saying that the state would “take a look” at legislation filed. But in 2009, Abbott ruled as attorney general that the Legislature could prohibit sanctuary cities. Less than half of Hispanic voters believe that state and local authorities should enforce federal immigration laws, a tenet of the sanctuary cities legislation. Republicans also filed two bills to require state agencies and contractors to use the federal electronic employee verification system, E-Verify. But Gov. Rick Perry, who leaves office in January, came out in front of Abbott, issuing an executive order that would require all state agencies and contractors to use the program. “Governor-elect Abbott is proud of the strong support he received from Hispanic voters in the election, and he remains committed to ensuring that the Hispanic community has a voice in state government as he works to build an even better future for all Texans,” Chasse said in a written statement. 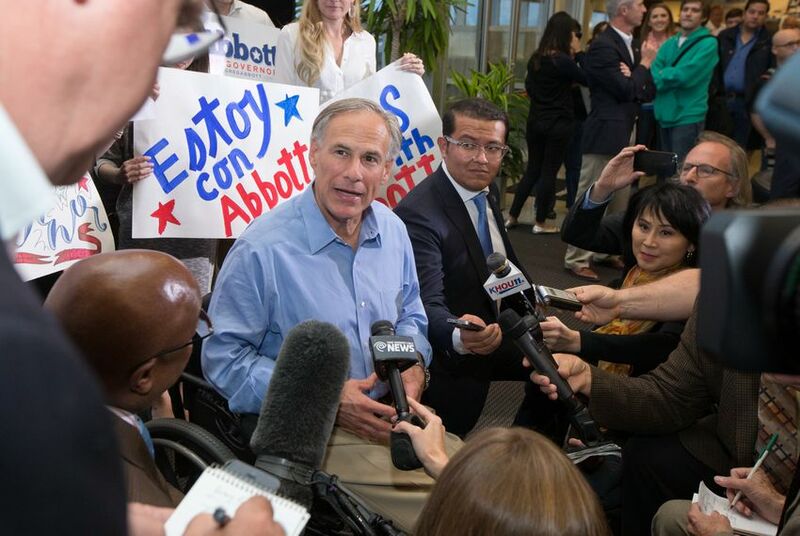 Abbott could deflect criticism by pointing to efforts to fill prominent positions in his administration with Hispanics. About a week after winning the election, Abbott tapped Carlos Cascos, the Cameron County judge and a Hispanic Republican, to serve as the next secretary of state — an apparent nod to the Rio Grande Valley region Abbott courted during his campaign. This summer, Abbott addressed the state Republican convention, highlighting the state’s “blending of cultures.” A day later, delegates of the state Republican Party adopted a political platform that included a more hard-line stance on immigration. And Democrats now have another attack line on the governor-elect, who last week announced that Texas would lead a 17-state legal challenge to Obama’s immigration order. In requesting that Obama’s order be declared illegal, Abbott and the other challengers indicated that the suit is not focused on immigration but instead pivots on pulling back Obama’s action, which they say is unconstitutional. But Abbott’s move could put him at odds with the majority of Hispanics who approve of the president’s action, according to national polls. Aside from the hit among Hispanics Abbott could take if some of the immigration legislation is signed into law, Henson added that immigration as a political issue continues to be a “treacherous territory” for Republicans attempting to bolster their standing with Hispanics.